I took this photograph at Shaktipur; Murshidabad on 28th December, 2013. 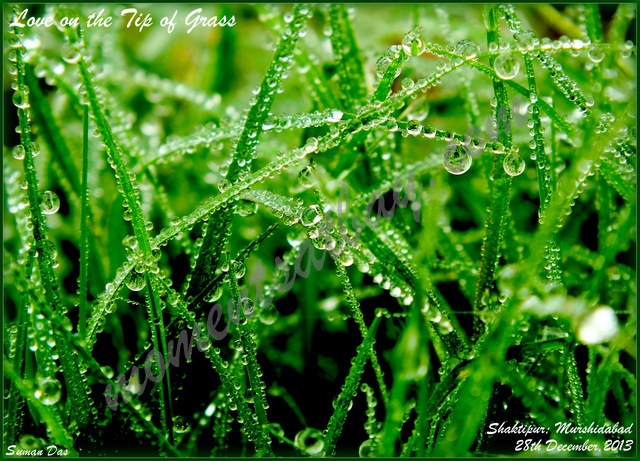 It was a foggy morning, and the sticky dew drops would not drop off easily, and would rather cling to the green, frail blades of grass most endearingly. And as the cold breeze made them shiver like innocent orphans in some ruthless orphanage, they appeared even more alive and suffering...as if they were afraid of the Sun that would make them die in no time, and yet the will to stay alive was so poignantly present in every quivering crystal orb that trembled but, nonetheless, fastened itself onto the green all around. Please leave a comment for a mere word can be very encouraging for me and also for this site!